Three tails. Chalk white wings. The body of the male dun is brownish black and the female has a pale thorax with a brownish black thorax. 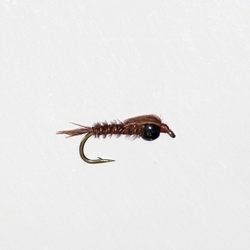 Duns emerge early in the morning and the spinners fall shortly thereafter. Emergence is delayed with colder air temperatures later in the season. Duns sometimes emerge in the late evenings. July through early October depending on the water. The Dun activity typically takes place in the late evening and the important spinner fall may take place anywhere from early morning until late morning depending on the weather and previous emergence density. Very slow to medium water with gravel or silty bottom. Common on the Harriman section of the Henry’s Fork as well as the slower water on the lower Henry’s Fork. Tricos are also very important on Hebgen and Quake Lake. The duns emerge first thing in the morning or late in the evening. Sometimes the emergence is sporadic. The spinners mass in clouds prior to egg laying. 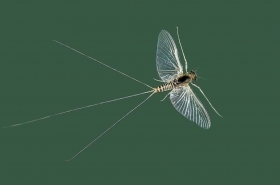 The spnners usually hit the water in heavy concentrations providing some exciting but challenging dry fly activity.